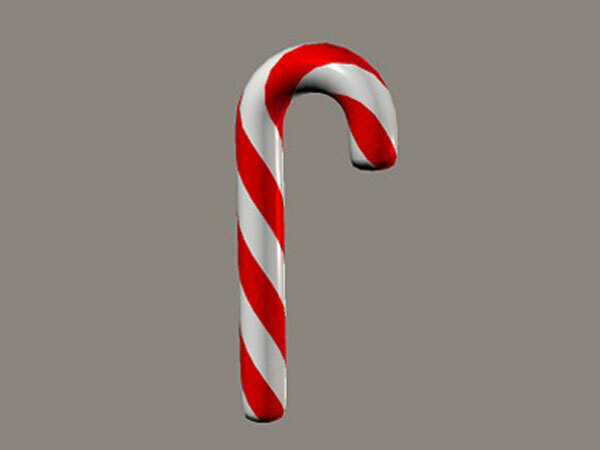 Candy cane model was converted to Poser prop with Poser 7. The .pp2 file should work with Poser 3 and above. Tested with Poser 7 and DAZ Studio 1.2. I made this model 2 years ago. I included an optional stripe texture. To apply change color of 'stripe' material to match 'cane' material an apply map. The prop don't really need map unless you want a fancier stripe. The model was built so the stripe material wrap around the cane. Candy Cane.jpg (texture file) can be put anywhere you like. (need better graphics card to use DS 3). Xmas, season greetings, yule, candy cane. Enjoy and Merry Chistmas..